The company also showcased Windows 10 Continuum feature which makes smartphones essentially computers with a different operating system and interface. The two new Lumia handsets can be called mini-computers - in the traditional PC sense. With the Windows 10 Continuum feature, the new Lumia smartphones can be hooked up to a monitor along with a mouse and keyboard using the Microsoft Display Dock. After connecting to a monitor, the phone's user interface switches to Windows 10 desktop interface with Start menu and other options. With this feature, both handsets act like mini-computers. The Microsoft Lumia 950 Dual SIM features a 5.2-inch QHD ClearBlack Amoled display with 1440x2560 pixels resolution. The display offers a pixel density of 564ppi and also comes with Corning Gorilla Glass 3 protection. The handset is powered by a 1.8GHz hexa-core Snapdragon 808 processor coupled with 3GB of RAM. It also offers 32GB of internal storage which can be expanded up to 200GB via microSD card. The Lumia smartphone sports a 20MP rear camera with autofocus, Optical Image Stabilisation, an f/1.9 aperture, and a triple-LED RGB flash module. It also sports a 5MP front-facing camera for taking selfies. The handset is backed by a 3000mAh battery. On the other hand, the Microsoft Lumia 950 XL Dual SIM features a 5.7-inch QHD ClearBlack Amoled display with 1440x2560 pixels resolution and a pixel density of 518ppi. The handset is powered by a 2GHz octa-core Snapdragon 810 processor coupled with 3GB of RAM. It offers 32GB of internal storage which can be expanded up to 200GB via microSD card. The Lumia 950 XL Dual SIM features the same camera and flash module from the Lumia 950 and both the devices also sport a dedicated camera button as well. The Lumia 950 XL Dual SIM packs a large 3340mAh battery which is slightly higher than the 3000mAh battery in the Lumia 950 Dual SIM smartphone. The Lumia 950 XL also comes with liquid cooling. 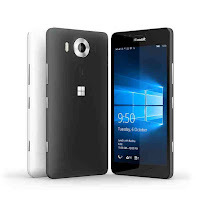 Both the Lumia 950 Dual SIM and Lumia 950 XL Dual SIM support dual standby with Nano-SIM card support. The dual-SIM dual standby 4G-enabled smartphones support dual Nano-SIM cards and come with USB Type-C ports. Both smartphones support fast charging by which both can achieve 50 percent charge in just 30 minutes.